Candy is the theme this month at Imagine, and while looking through my supplies I came across my Bouquet Kaleidacolor pad. Candy and Kaleidacolor?! Yes! I see the tropical package of Skittles when I look at the Bouquet color palette … if only my inks tasted like Skittles … right?! This easy card comes together nicely, and quickly, thanks to the coordinating palette of the Kaleidacolor pad. For my card, I chose to use each color individually, without any blend. I can easily expand my palette by clicking the colors together and stamping a ‘blend’ onto my block. Instantly, I double my color options. Since Kaleidacolor is a water-based dye, it makes the perfect ink for watercoloring. In the tutorial below I break down how to detail a stamped image using a watercoloring technique. 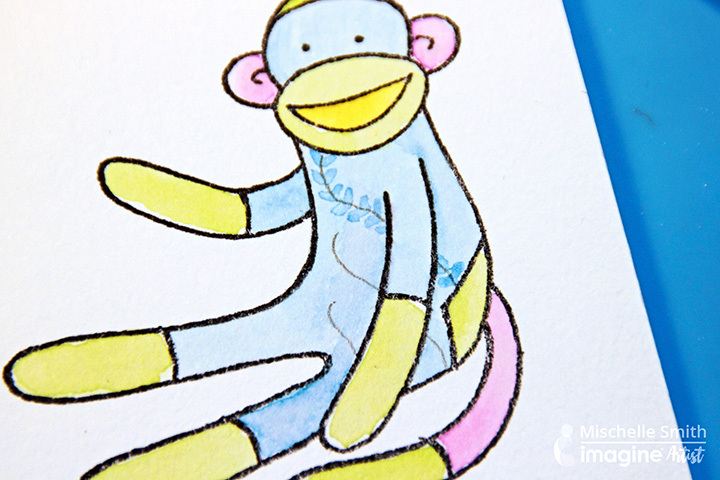 Stamp the sock monkey image on watercolor paper with StazOn Jet Black. 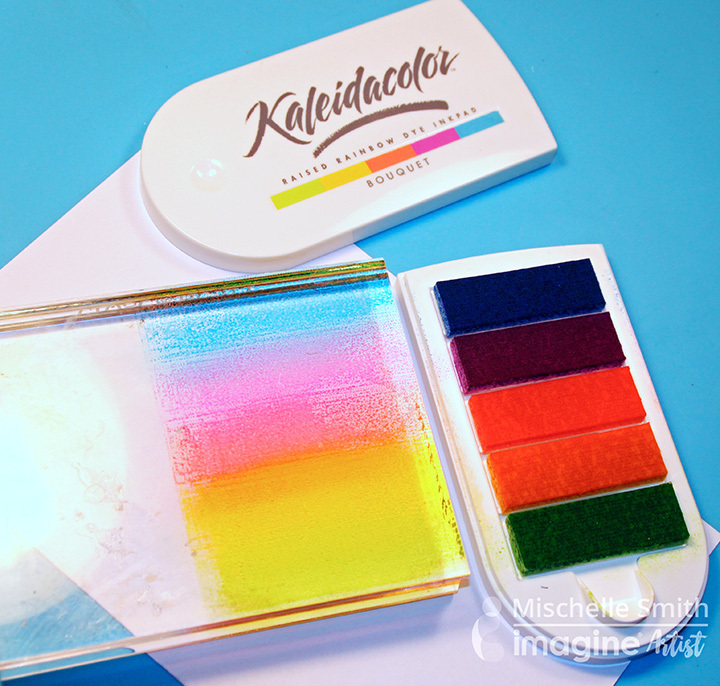 Stamp Kaleidacolor onto acrylic block to use as a palette for your watercoloring. With a paintbrush, gently prepare image with water. Pick up desired color from acrylic block with a paintbrush, and paint the area prepped with water. The first layer of color is a light, gentle wash. Use a light hand when applying. 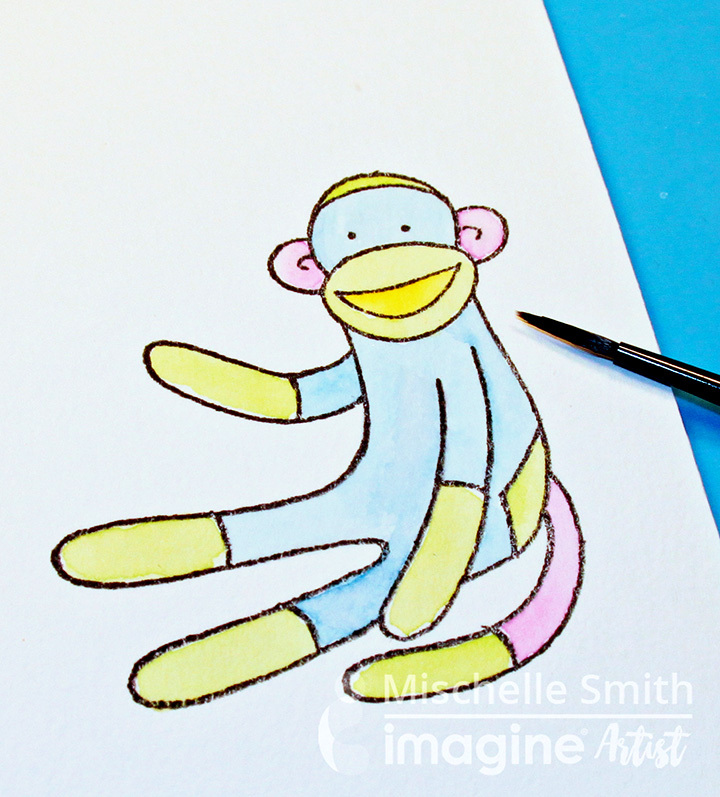 Use a pencil to sketch guidelines on Sock Monkey. If needed, do an image search for a real photo of a sock monkey to better understand the patterns and lines. The pencil lines will be erased when the monkey is finished and dry. Begin adding ‘heart’ shaped patterns to the pencil lines and work to fill in the entire monkey. Cut out the image and set aside. To finish the card, prep watercolor base and add tangerine color. Loosely lay down color and let dry. With scissors, distress the edges of the tangerine panel and attach to card base with foam tape. Attach the Sock Monkey and washi tape him to sit on. With a Tuxedo Black Memento Marker, draw lines and squiggles around the panel. 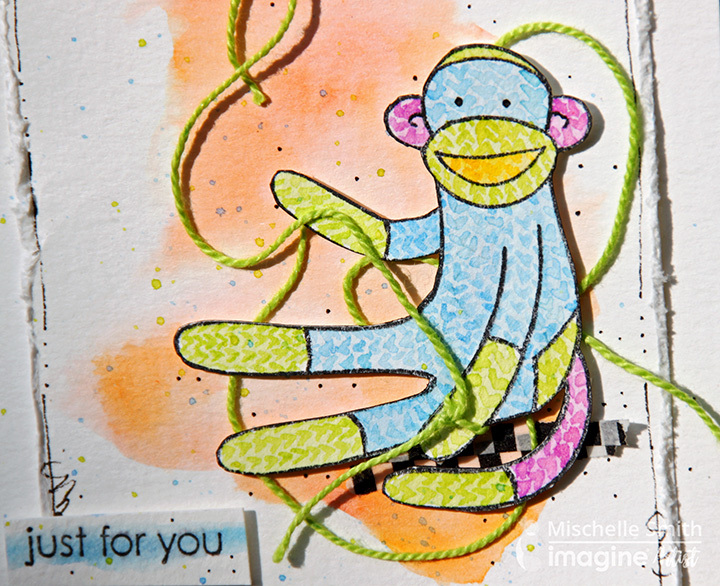 Stamp “just for you” sentiment, brushed with a swipe of color, and add to card. Attach lime twine and add any additional details as you see fit. Thank you for stopping by the Imagine blog! If you liked this tutorial then please comment below or share on Facebook! This entry was posted in Cards, DIFFICULTY LEVEL, INSPIRATION, Intermediate, Mischelle Smith, PROJECTS, Techniques and tagged cardmaking, DIY Inspiration, Kaleidacolor, Memento, Memento Dual Tip Markers, StazOn, watercoloring. Bookmark the permalink. That’s a sweet card ! Thanks for the explanations.